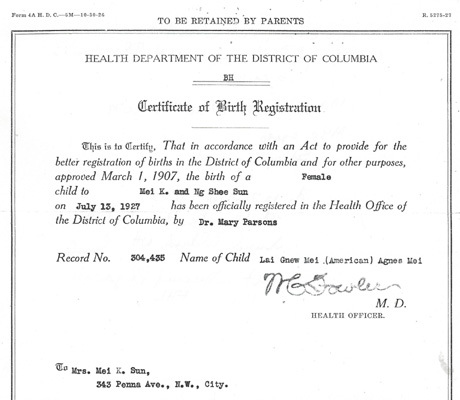 “Chin Wah Pon birth certificate,” 1916, Chinese Exclusion Act case files, RG 85, National Archives-Seattle, Chin Wah Pon (Frank) case file, Seattle Box 810,file 7030/13041. 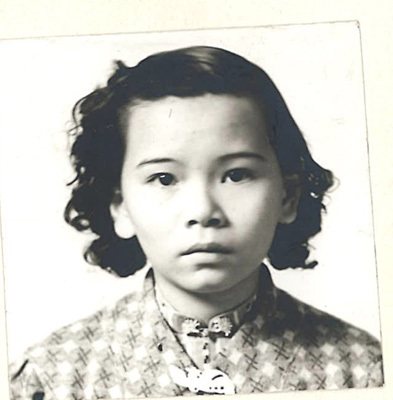 In 1921, Wong Ah Look applied for a return certificate for her son, Chin Wah Pon 陳華泮. 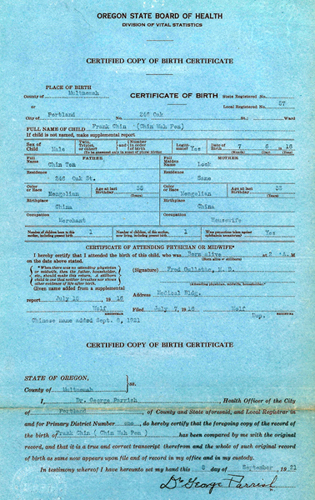 She presented his Oregon State birth certificate stating that he was born on 6 July 1916 in Portland. 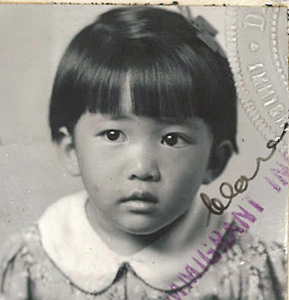 She was leaving for China with Chin Wah Pon and her other children, Chin Wah Ching (James), age 3; and Chin Oy Gim (Marguerite), age 2 months. It was alleged that her husband, Chin Ten/Ton, the father of the children, absconded with a large sum of money and his whereabouts were unknown. 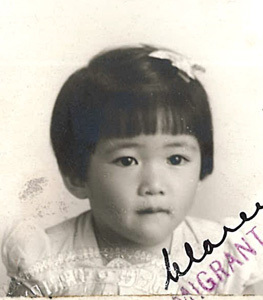 Wong Ah Look did not plan on returning to the U.S. so she gave the immigration office her Certificate of Identity to be cancelled. “Chin Wah Pon Form 430 photo,” 1921, CEA case files, RG 85, NA-Seattle, Chin Wah Pon (Frank) case file, Seattle file 7030/13041. Their applications were approved and they left for China on 15 October 1921. 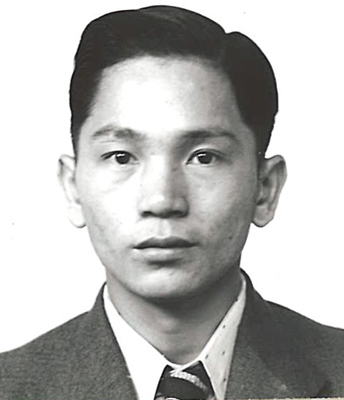 Chin Wah Pon was admitted to the U.S. at Seattle. 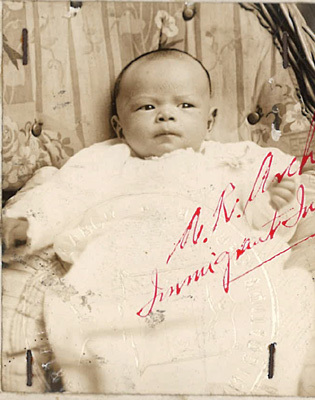 The Immigration Chairman concluded that his birth certificate was legitimate; he had some of the same identification marks as the person in the 1921 application; and the ears in the 1921 photo appeared to be the same as those of the applicant in the 1940 photo. 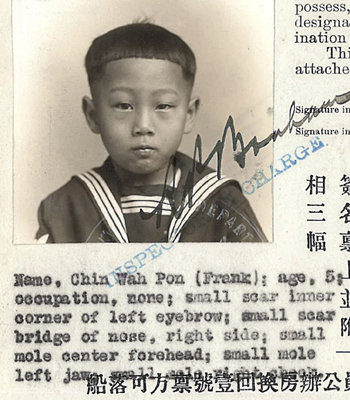 “Chin Wah Pon Form M143 photo,” 1940, CEA Act case files, RG 85, NA-Seattle, Chin Wah Pon (Frank) case file, Seattle 7030/13041. The reference sheet in his file includes the file numbers for his parents, three brothers and a sister.